The kids and I spent a good chunk of this beautiful afternoon playing ball at Sorauren Park in Parkdale. 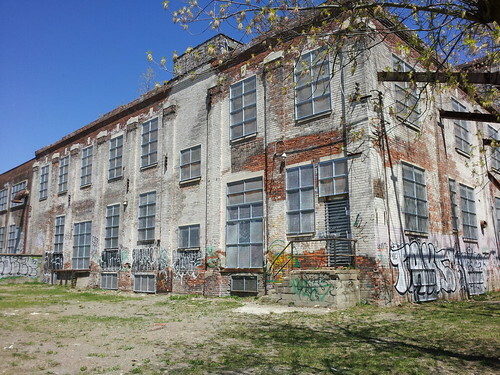 That's where I found this old linseed factory. There's actually a pretty cool plan for a Town Square to completely revitalize this space. I thought I'd grab a picture of the old girl while they raise the funds. Great shot. I have a peculiar fascination with abandoned factories and warehouses. I used to have a lot of clients in and around Buffalo and Rochester so I would see some incredible and at one time, dynamic buildings. They're as striking as they are haunting. In the movie, The Company Men, there are some wicked shots of these types of buildings. Again, nice eye, great shot. So often buildings like this are considered an eye-sore. The angle and lighting in this shot actually make it look like an attractive place for a photo-shoot. Thanks for thinking of me on this “Old Home” website - many memories and stories about that area that go back to a munitions factory, complete with armed soldiers, at the corner of Wabash Avenue and Sorauren during WWII. It was owned and run by Dominion Bridge Company and became a TTC Bus garage after the war. We used to ride our bikes to the end of Wabash Avenue where it joined MacDonnell Ave. to watch the trains go through there - It was a block from the W.H. Dunne Skate works - some of the older boys used to hop on a slow freight to wherever they went and hope to get back on another one - I was always too chicken for that!